Bambi are no longer supplying the SB42-46 lubrication oil, it has been superceaded by a more superior oil, the BPB1110S lubrication oil is synthetic. The two oils are fully compatible. Yes, it is sufficient just to drain out the old oil as far as possible in the usual way, but there is no need use any cleaning agent or other extreme measures. Obviously the more of the old oil that is removed ensures the new oil’s advantageous properties are retained as far as possible. 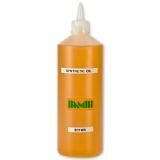 Ensure your oil lubricated air compressor is kept in tip-top condition by using original Bambi oil, buy direct from CJS Direct.